In the UT Physicians High Risk Children’s Clinic Dr. Ricardo Mosquera helps patients like Taliyah Dent, 6, who suffers from asthma. The UTHealth High Risk Children’s Program, a collaboration between The University of Texas Health Science Center at Houston (UTHealth) and Children’s Memorial Hermann Hospital, has been named to the national network for Children and Youth Special Health Care Needs (CYSHCN). The CYSHCN network, established by the U.S. Maternal and Child Health Bureau, works to integrate experts and families into a national research consortium to develop, conduct and share research to assess and improve health systems. 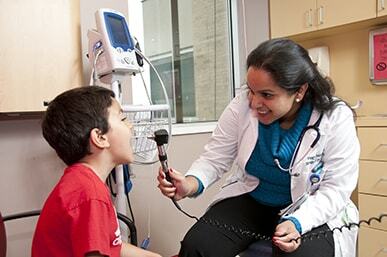 Formerly known as the Pediatric Complex Care Program, the UTHealth High Risk Children’s Program is one of just nine nationwide. Less than 1 percent of all children are medically complex but their care accounts for 30 percent of all pediatric health care costs and more than half (55 percent) of all pediatric inpatient costs in children’s hospitals. Repeat hospitalization is a particular issue, absorbing the overwhelming majority (85 percent) of all pediatric 30-day readmission costs. The UTHealth High Risk Children’s Program takes a more integrated and less fragmented approach to lower the incidence of serious illnesses and the related costs. A clinical trial, led by Mosquera and published in 2014 in JAMA, found that emergency department visits, hospital admissions, pediatric intensive care unit admissions and length-of-stay fell by between 47 and 69 percent. Costs to the health system were reduced by an average of $10,258 per child per year. The program includes the UT Physicians High Risk Children’s Clinic, encompassing coordination of care, a multidisciplinary team of providers, 24/7 access to care, home visits and telemedicine. UT Physicians is the clinical practice of McGovern Medical School.